Can we stop promoting Amex now. They are uncompetitive in the market. With 1:1 parity else where and the same benefits on other cards why would anyone want to use Amex? I’m happy to get the information & have an opportunity to discuss & digest it – not many here would see it as promotion of Amex, it was big news/ big changes and worth the column space. If Amex doesn’t work for you any more, no problem – but Amex cards will still feature prominently in the card strategy of the vast majority of HfP readers so you are clearly in a small minority who are dismissing Amex completely now. Loads of reasons why I will choose Amex personally (joining a portfolio of cards), including sign-up bonus, referral bonus, travel insurance, free lounge passes, loyalty bonus, ongoing miles earning, Shop Small and statement credit promotions – for others, 2-4-1 will be the big attraction. I think Rob is clearly promoting Amex. No disrespect I have noticed that before this huge change and Rob wrote few articles on why we should apply for Amex. I wish I could say this is coincidental but I am afraid I don’t sadly. I am a fan of Rob but on this subject I am sorry! Scam? Where’s the scam? The rules are being highlighted so they can be followed and you don’t end up taking or not taking out AMEX products for the wrong reasons. I totally disagree. As far as I am concerned, my reading is that Rob always tries to be impartial with his credit card comparisons, including Amex. He always tries to point out the best Avios (and Virgin nowadays) earning and burning strategies whatever card that may be. If another card were to offer such sign up bonuses as Amex, then they too would get possibly more coverage. Every card issued in the UK may have it’s own selling point, but very few fall into the Avios/Virgin category. The lack of commercial awareness shown by some people is scary. If we get someone as a reader, we’ll make a few quid somewhere, somehow – if only because we get paid per page view for ads we sell direct. If we don’t have them as a reader, we don’t. If we are not providing useful and ‘all of market’ content then we won’t have any readers in order to make any money from them. Covering everything that is going on, regardless of commercial relationships, is sensible. Or, put another way, we actually make more money by writing about interesting stuff that doesn’t pay us than we would if we swapped those articles for less interesting ones that did. Since when did an article discussing the cancellation of all amex business for two years equate with promoting amex? Criticism of ads, sponsorship, freebies etc is recurrent and tiresome, nobody is forcec to read them or even the blog at all. The blog costs considerableb money to run, employs staff and costs us nothing to read. Always thought it odd that soee are quick to complain about benefits to Rob abd the blog but ard forever silent with respect to the personal benefits received from reading it. There is no other blog that would have done this is as unbiased a way as Rob. > why would anyone want to use Amex? Because on Plat alone I’ve probably had 150K MR and statement credits of around £1K. Lounge access and some other bits. Paid so far £450. I continue to see value for me for now. Don’t forget that 2nd person has to pay a big chunk of cash (in YQ and taxes) to be able to travel. I’ve done the maths on BAPP 241 redemptions many times (earned four vouchers in last five years). I’ve never actually redeemed a 241 because there was always a better way to spend my Avios *and my cash*. Why do you keep putting spend through a card that rewards with something that has no value for you? Sign up bonus plus the referral made it worth getting the card. Put the spend through quickly, close the card, get most of the annual fee refunded. The 241 itself is effectively worthless to me. The voucher is worth at least 8k Avios. BAPP 241 can save you 150,000 Avios easily. Gold – if you spend exactly £15k – earns 1.66 miles per £1 which is literally unbeatable. SPG card is the ONLY way to earn miles in schemes like United, AA etc and gives 1.5p+ per point back if you keep as Marriott points. And given how many readers pay for Plat but never use it (inc me) you need to assume people appreciate the value. I’m planning on using mine for Japan I should save at least 200k points. Bargain paid for itself I’m happy. Although if you’ve got VS miles I’d have a look at ANA via VS too – 120k (and £400 in taxes/fees) for return in F is a pretty nice deal! Travelling to Tokyo in F on a 2-4-1, will save at least 204,000 points going off peak in F and 220,000 points going peak in F.
Even with the taxes (whatever you care to call BA’s additional charges), your basically paying the equivalent of an economy ticket each, for the pleasure of traveling in BA F. This is for a “direct” return ticket, that would be close to £5k otherwise! Just booked my 2-4-1 LHR-NRT all in a lovely 787-9 Dreamliner in BA F.
Thats all down to Rob! Thanks Ronster, yes I’ve been plotting and planning for my 60th (😱) I saved my voucher for this flight. Question I’ve been looking at the different airports Hanada and Narita. I’m drawn to HND because it’s quicker to city, any reason you choose NRT? Assuming you don’t look too closely at the consequences of “saving” 150k Avios. There are BA fans who mindlessly redeem a big pot of hard-earned Avios and a 241 to get them to places where other schemes would cost less (miles + cash), even though the other schemes don’t have 241 vouchers. Sometimes it would be even be cheaper to buy miles outright in the other scheme. Sometimes it would be cheaper to buy a cash fare. BA and Amex aren’t issuing those BAPP 241 vouchers out of generosity. Agree with you. There have been times here in the past few years, when many of us have actually cancelled 241 F to Asia, Dubai, Rob included, to buy cash fares in the QR,AY,BA, and other airline sales. Of course it makes sense to buy in a cash fare sale, but it used to be only a couple of £100 more than the fees. Now the fees have increased outrageously, the sale fares are also higher tho, it’s swings and roundabouts. But the flexibility of avios fares is paramount to a lot of people. RFS esp useful. Agreed that some people will not get any benefits from Amex. And some people will not be savvy enough to use the benefits wisely. My last 241 saved me 192000 Avios. The redemption fees and taxes were £550 each. The total cost, including the cost of the Avios, was £740 pp. We flew out in F and back in J. The cash price of the flights would have been £4k each. The cash price of Y flights would have been about £660 each. What will change for me is the cost per avios now the sign up bonuses have gone. But I still have a huge cache of Avios to use (thanks Rob and others) and the BAPP continues to make a lot of sense for me personally. Eacactly, our 241 to Asia in F every year is worth 1000’s. Yes we have to pay fees, but it’s basically the price of a Y tkt, but is fully cancellable. That’s the beauty of those tickets. Def will continue to use full amex range, albeit via referral earnings within the family. But that’s just fine. Get great value out of offers, my iPad Pro was knocked off overhead locker recently, few weeks ago on a dub flight, cracked the frame and glass, and plat ins coughed up without any problems. So we will be staying with amex. Used a Lot of their offers last year, covered both fees easily. SS stamps still being used..v useful. Will stock up again in Dec if as returns. Plus for paying our bills, utilities etc, monthly, takes the sting out of them a lot! They do check the address but if you put in the cardholders address as billing address it clearly works. My address has never been checked with Amex. Are you saying you put in a fake billing address when booking?! I’m pretty much done with Amex. I don’t see how they can continue to charge for cards that offer such comparitavely poor benefits. I’d have rather seen them go down the US route of once in a lifetime signup bonuses, but with big multipliers for ongoing spending. Me and my partner have probably put £50k a year through Amex for the last 3/4 years. Don’t know if that means we’re profitable customers or not but either way they’re losing it! Out of interest Where are you going instead? Many people will lean towards the HSBC mc elite, fee £195, no bonus after 1st year, is xhurnable according to some here, good earning rate, free lounge passes, plus for £60 you can add a 2nd person, with free lounge access also. It’s earning rate of 1/£ for elite card, or 0.5/£ for premier. But with high threshold for obtaining a card. Also the new replacement lloyds mc with o.4/£ not bad for a free card. We may, just may drop hsbc and continue with our lloyds replacement for non amex spend. Hasn’t Barclaycard just blocked using any of the fin tech cards for payments inc curve. how long the party lasts – who knows. There was a horrible statistic in the paper yesterday: [in light of UK Finance statistics that show that 46.7 per cent of the UK’s £67.3billion outstanding credit card debt, £31.5billion, is on cards that are not bearing interest] ie balance transfers and interest-free ‘purchase’ credit cards. That’s a lot of people – alongside the savvy stoozers – potentially getting into unmanageable credit card debt – and plenty of them on a crazy merrygoround of paying off credit with yet more credit. @Harry you keep saying this but balance transfers have been around for years. Which is exactly the same thing except they aren’t charging you a fee when using curve. It’s absolute insanity how easy it is to borrow money on credit cards at no or little interest compared to going through a “genuine” loan application. I honestly cannot see the justification for giving someone a credit limit on a card of more than a few months salary, the card companies have next to no idea what that money is used for. If you require borrowing in excess of that you really should go through an application if lenders want to claim to be responsible, although I think that given rates are 0.75% small loans should more accurately reflect interest rates. I run a small business with 7 digit turnover, HSBC give me a £30k unsecured overdraft (renewal fee £405) and interest rate 9.9%+ base yet I can go and stick £20k on my MBNA card for 3.9% Apr no fee, no credit scored application. If you don’t pay MBNA they can bankrupt you. If your company goes bust (‘revenue = vanity, profit = sanity’) the bank loses the lot and you keep your nice house and car. I’d say that’s there Amex are going…. if they continue to think the UK market is worth staying in. Sincerely hope not!, but the 5 x and 10x for ongoing spend more than makes up for that in the USA l guess. My friends still say their miles are rolling in. I’d much prefer that to what was just lost. Less hassle, less impact on credit files (not that it matters most of the time for me as I’m on long mortgage fixes), and a more straightforward honest relationship rather than feeling guilty for occasionally taking advantage of loopholes. Amex offers do it for me. £200 off £600 spend and shop small on both main card holder and supp card basically pay the £450 fee. So I’m then getting all the other benefits for FREE. I ‘ve had personal AMEX 6 months ago, now I can apply the Business AMEX and receive the bonus. Even the business AMEX does not block you get the personal AMEX sign up bonus under the new rule, I still need to wait 18 more months to apply the personal AMEX and receive the bonus. The changed rule means I do not need to cancel my Business AMEX before I apply the personal AMEX in the future. Correct, as I read it. No Bits today so OT – Rob, are you planning on writing about the recently signed feeder deal between Korean Air and FlyBe? Seemed a bit too niche to be honest. Part of SkyTeam, and partners of Delta, KLM, Air France among many others. I assume this also applies to Amex Gold Corporate cards where I signed up for MR’s? 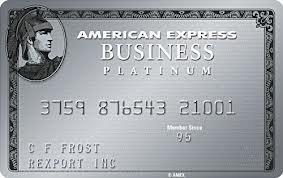 Is it correct that you will receive the bonus on the (personal) Platinum card even if you already hold another personal Amex, provided that personal Amex is not ‘Membership Rewards-enrolled’ (BA Amex for example)? Can you cross refer from personal to business? So – say – a personal Platinum cardholder sends a referral but the recipient actually wants to apply for a Gold Business card? Business Gold works. Adding personal Plat still needs you to have gone 24 months without a personal Plat/Gold. Thanks so I know I won’t get sign up bonus for personal Plat but can I hold both Bus Gold and personal Plat is the main question? Yes you could always do that. You can hold gold credit and Plat now too. Yes, no problem having both and no problem getting 2 bonuses as long as you get Bus Gold first and meet the personal Plat 24 month rule. I just hope all the cancellations mean I’m slightly more likely to get on the Platinum Vista chocolate workshop next weekend. I’m keeping my Amex collection. I’m not bored of the treats yet. I do get why it isn’t worth it for everyone. Agree. You work out it’s value to you and keep or dump. Either it works for you or it doesn’t. Another factor obviously is no matter how poor is it compared to before the recent change, what works better for you? There are no other methods of earning hefty Avios from spend, I know there’s an HSBC product but that’s quite niche, and if you don’t want VS miles where do you go credit card wise? My primary use of Avios has been and will likely continue to be RFS, which is great value. I’m happy to pay 2p/Avios if I’m able to regularly redeem them at 4p+/Avios. Wouldn’t you be? @shd – Fair point, for the %age of folk who can genuinely get a value in excess of the cost, but many of Harry’s ‘nudge, nudge, wink, wink’ ruses for acquiring Avios have a cost in excess of the value the majority of people (IMHO/my own experience) can achieve, and so are far from being a good alternative to the signup bonuses which Amex have removed. I appreciate everyone places a different value on Avios, but people need to ask themselves, e.g. “would I REALLY pay £x for that CW flight” when calculating a value. Any thoughts on the pros/cons/implications/costs of setting up a company specifically for the purposes of earning Amex bonuses?? It is a faff and there are ongoing requirements to submit confirmation statements etc. Sole traders are fine. Remember that you are always liable, not your company, so Amex takes minimal credit risk. Am I correct that I can still apply for the ba card if I want to? You can apply for the BA card but you won’t get the sign up bonus if you have had a BA amex in the past 24 months. I don’t want to put any KF miles in to my KF account at the moment as they have the strict 3 yr expiry policy and I am not planning on using them in the next 3 years. I was saving Marriott pts through SPG Amex churning once a year, Heathrow Rewards and doing some MR transfers to Marriott to build them up over the next few years till we are ready to go to Oz again in a few yrs time. Was trying to build both our Marriott accounts up to 120k each to give us 50k KF miles each then top up with Hrwatheow Rewards and MR pts when I was ready to book. Now won’t be able to get up to 120k Marriott points because we won’t be able to churn the SPG Card so readily. Need to come up with another plan. Perhaps I read it wrong, but I thought yesterday you were looking for a few miles to top up ? I don’t know how many you have but if they are going to waste look at their partners closer to home…Lufthansa..Egyptair..Swiss..Brussels..Turkish..LOT..and even Virgin Atlantic. You might be able to use them up with a trip closer to home, despite their recent devaluation. If you see this, I meant to add that their Star Alliance partner rewards also increase on April 16th. Economy is no change…..25k around Europe, but Business is up accross the board. Unlike Singapore themselves you will undoubtedly incur fuel surcharges, some more, considerably, than others. We have 90k and 44k Marriott pts. I was aiming to get to 120k in each account so I could convert to 50k each KF miles then top up with MR pts and Heathrow Reward pts nearer the time when I needed them. Just storing them in Marriott accounts free of charge till I need them. That was my strategy for the next couple of years. Now I can’t see us reaching 120k each Marriott pts so will need to abandon that plan and probably just convert to Avios or Virgin in the future. I have plenty of Avios and Virgin miles for the next couple of years so will wait and see what happens. SIN-BNE is 62K KF miles now for one way redemption in Business. Plenty of people will be cancelling Plat & waiting 2 years – –> also means cancelling the associated Priority Pass. You might want to reconsider the Travel Plus Pack from Barclays – £16.50 a month, minimum 6 months, on their free current a/c – 6 free lounge passes & other free benefits include a good-looking Travel Insurance policy & RAC breakdown cover. You could have his ‘n hers current a/cs, 6 months each then rinse & repeat for 12 Dragonpass entries pa, no limit on who gets to use them or how many at a time, you could use all 6 in 1 go if you felt like it.